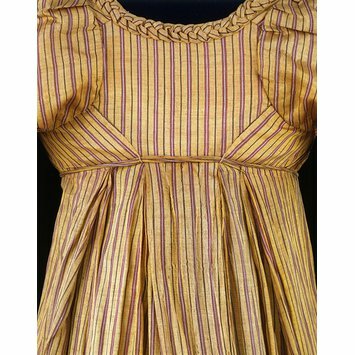 The cut of this silk dress was very fashionable during the early 1800s. It complemented the simple lines of the high-waisted dresses and created a slender-bodied look. The seams on the back are close together on the shoulders and almost meet at the waist, forming a diamond-shape. This gives the appearance of a very small back, emphasised by the oversleeves which are set extremely far in. The construction is similar to that of gowns made in the 1630s when the sleeves were also set very far into the back. Inverted pleats at the centre back give shape and fullness to the skirt. A small roll or pad was often attached under the back of the dress to create a subtle roundness and help the fabric hang in fan-like folds. High-waisted day dress with long sleeves (altered) and short over sleeves. 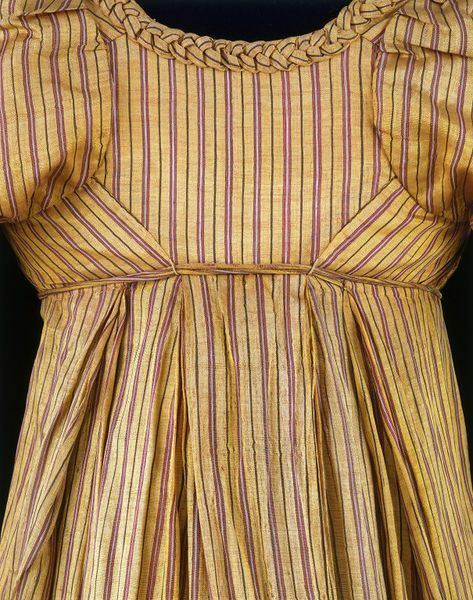 The neckline is square at the front and scooped at the back and is decorated with applied plaited trimming of the same fabric. The back of the skirt is gathered and the front is cut from a single width of fabric which falls straight to the ground. The excess material is not gathered but pulled towards the back with strings, rather like a wraparound skirt. Each cuff fastens with two Dorset wheel buttons. Bust lined with linen, fastening with 20th century press studs and hooks and eyes.